The moment I realized I had all the ingredients I needed to make these tacos happen tonight, I got excited. Probably a little too excited. Salmon tacos have been on my list of ultimate comfort food since I tried them for the first time a couple years ago at one of my favorite Mexican places called Taco Mesa in Costa Mesa. They serve this incredible salmon taco with a creamy butter sauce along with a mango relish that is to die for. But, at $4/taco I soon realized that I needed to recreate this in my kitchen and save some dough. This recipe is all-the-way-paleo if you just omit the tortilla (replace it with mixed greens!) There’s something so incredibly delicious about salmon with agave and butter as well. 1. Chop up the onion, tomato, cilantro and mango and combine in a bowl to make the salsa. Add fresh lime or lemon juice and then salt and pepper to taste. 3. Once the salmon has cooked for a few more minutes, I flip it over once more to cook for about a minute on the side that had the skin (so it gets those nice, even grill marks). 4. Meanwhile, I combine the agave syrup and ghee into a small saucepan or frying pan, and melt it together on low heat. I gradually turn up the heat while stirring, allowing the agave to bubble and caramelize. 5. 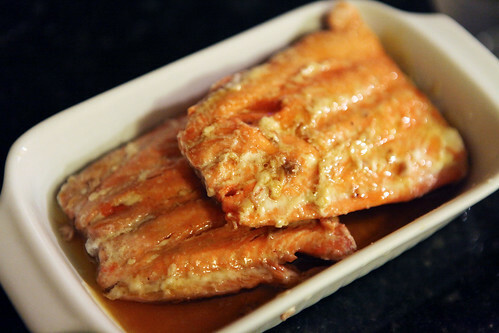 Transfer the salmon to a plate and pour the butter sauce over the salmon. 6. Heat either two small tortillas per person, or one large tortilla. If you have a tortilla skillet, great! If not, you can use the grill or the toaster oven. 7. 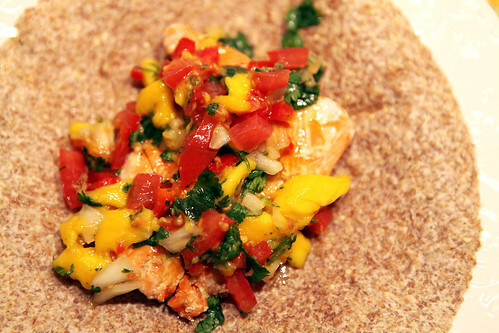 Add the salmon and salsa on the tortilla and eat!